Database Systems Corp. (DSC) provides contact management products and services including Automated Messaging services delivered from our multiple call centers. These services and systems are ideally suited for providing event reminders and notifications. Event reminders can be launched announcing a new concert or upcoming event. Pre-recorded messages can be played to call recipients or answering machines. If the prospective concert attendee needs to talk with a reservation agent, your message can be programmed to allow a "Press 1...." option and the call will be transferred to your ticket office. Calls can also be automatically placed if you need to notify attendees of a special event or if the event has been changed or cancelled. Simple to complex scripts can be developed using touchphone technology. Personalized information from your custom database (such as name, event date and time) can be included in your reminder phone calls. In some campaigns, you may only want to leave a message if contact is with an individual. In other campaigns, different messages can be played based upon contact with an answering machine or a person and based upon the time of day. 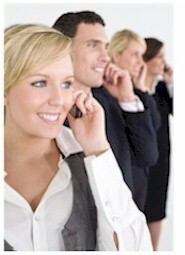 Contact DSC to learn more about our event phone reminder services and systems. To learn how to use our voice broadcasting services, click on the Voice Broadcast Quick Tour. (Popups must be enabled on your browser). Black Spectrum Theatre utilizes our voice broadcasting and messaging service to contact patrons of its theater. Messages are left both to answering machines as well as individuals. Patrons are notified of upcoming events and performances. DSC can provide your organization with a complete, turnkey voice broadcast system that can perform event reminder notification. If you need to get a project or campaign started immediately, we can provide your organization voice broadcast outsourcing. Contact DSC for a FREE analysis and quote and to learn more about our event reminder services and phone systems.